When you’re looking to improve your business, if you don’t have a map of how you’re going to reach your goals and objectives you’re going to struggle. That roadmap has to be something that’s concise enough so it’s easy to communicate whilst providing a critical view of how key goals and objectives will be met. Most businesses carry out some form of business planning often this is in the form of project plans. Project plans are great but they provide a granular detailed view on individual tasks and resources – this is often too much detail when communicating key objectives to a wide audience. Business roadmaps provide a business or team a structure for leading the organization through its strategic objectives and how they will be achieved. 2/ It describes the high-level timescales when things will be achieved. Business Roadmaps are usually visual affairs that are communicated on one page. As the roadmaps are constructed in a simple way they are usually very easy to communicate, often as a visual aid during a presentation/briefing they focus on the key elements. Roadmaps usually require the collaboration of several teams to help create them. This is often due to the roadmap itself displaying data relating to multiple workstreams and owners. To provide a robust roadmap, teams MUST collaborate to create them as they can’t usually be done in silos. Roadmaps cut to the chase and focus on key activities and deliverables and as such, they are great at cutting through the minutiae and presenting what really matters. 5/ They drive strategy and prioritization, providing a clear scope. Because of focusing on summarising what matters roadmaps produce a strategy that is easy to understand with a clear scope (tied to deliverables. Detailed business/Project plans are great, let’s get that out of the way. But as we said above, detailed project plans can get far too large and detailed) this isn’t great when you’ve got to communicate out to the masses. The key difference is that roadmaps capture the actions, goals, and dates in a high-level and visually simple plan. Unlike Project plans roadmaps do not care for the detail but rather provide a signpost of the overall direction. Note that roadmaps should not be used instead of project plans (they are not detailed enough! ), each tool has its place. Business Roadmaps are great for Continuous improvement! Your continuous improvement strategy and the resultant projects can be large complex challenges and despite the multitude of tools and systems out there, it’s usually significantly hard work to implement. Your improvement strategy can be severely hampered if your organization misinterprets (or is unaware) of your objectives and when you intend to execute them. There is also likely to be key dependencies and metrics that have to be achieved in order to drive the timeline. By using a roadmap these “gates” can easily be communicated and you can facilitate an approach for delivering your improvement goals. As ever with tools like this, it’s key to the roadmap that your objectives are measurable so that you can state where you started from and where are you aiming to go. The great thing about using business roadmaps for use in continuous improvement programs is that your roadmap can include additional notes such as which key metrics will be used to validate your performance, and what levels should be attained. A roadmap is merely a fancy phrase for a set of high-level tasks and/or deliverables which are displayed over a time period. A typical business roadmap will identify the business challenges in a step by step linear fashion. This helps the business by visualizing the major steps required to reach an objective. It enables the “team” to then assess those steps to ensure they are appropriate and that the timings are both sensible and achievable. The roadmap portrays a plan which is intended to deliver a particular goal or set of objectives. Usually, it displays the key milestones that are the “ingredients” to deliver the overall strategy. Roadmaps can come from lower level project plans which articulate key deliverables or can be used to drive things the other way with the roadmaps defining the requirement which then is planned at a detailed level. Whichever the case, both business roadmaps & project plans are usually inter-related. Roadmaps are useful because they provide a mechanism on how the business visualizes the “how” things are done and where the value is added. Roadmaps are not merely a document to list your key problems and then let it gather dust. It’s a strategic document that defines the work ahead and needs to be continually reviewed and assessed as the program unfolds. It is also not a project management plan. Roadmaps are a higher level strategic view of the key activities. Roadmaps don’t show the individual tasks and assignments and timelines at a micro-level. Your roadmap (and your template) can be structured to state where you want to be in key intervals. For example, where do you intend to be in six, twelve, eighteen months time? Your roadmap can be used to articulate this. Your action plan should include an outline of the key activities in the order that they will be executed and the duration. Often these objectives require the successful completion of the previous activities. This enables the capture and communication of key roadblocks or risks. By documenting your action plan you have something that you can then use to communicate key objective to the workforce to obtain buy-in and support. Adding elements such as review cycles to your plan and understanding who the key stakeholders are can also help. What does a business roadmap look like? 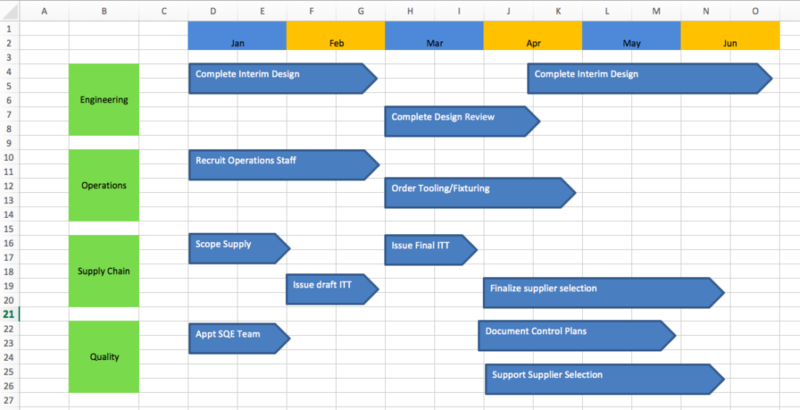 Below we show 4 typical examples of an Excel based Business roadmap. We’ve included screenshots of each example so you can replicate if you need. Note the tasks in these are simple and you might want to expand the size of these if you have a complex set of strategies to deliver. They are fairly simple to construct in Excel, you need minimal excel skills (you’ll need to know how to shade cells, merge cells and place borders around things. In the below example you can see that we’ve got the timeline running accross the top (4 quarters) and functional groups running down the left hand side. Key deliverables by function are shown in thier respective quarter. Similar to example 1 this reverses the functions and timeline placing the functions along the top (in swimlanes) and the timeline down the side. In this example, the focus is more on the tasks than clear deliniation between functional owners. In this example, you can see we’ve removed the swimlanes and differentiate between functions with color (including a key on the right hand side so you can see whos who). Very similar to our first example this shows the key objectives by month. So there you have our four examples. Why not give it a try and develop your own business roadmap excel template. As ever we’d love to hear your feedback in our comments section below.